I m a big fan of mixed rice dishes. That too podi/powder mixed rice. In the morning hustle, i just dry roast whatever spice that come into my mind and mix it with some lentils and make a podi saadam/rice. So, far it is a success and the co-eaters @ my hubby's office they too like it. This podi was an inspiration from Aval Vikatan's Supplementary cookbook. This can be made ahead and stored inthe refrigerator and used when needed. They make a good accompaniment with idly/dosa too. 2-3 nos curry leaves, torn into pieces. Dry roast each of the ingredients separately. Roast sesame seeds last. 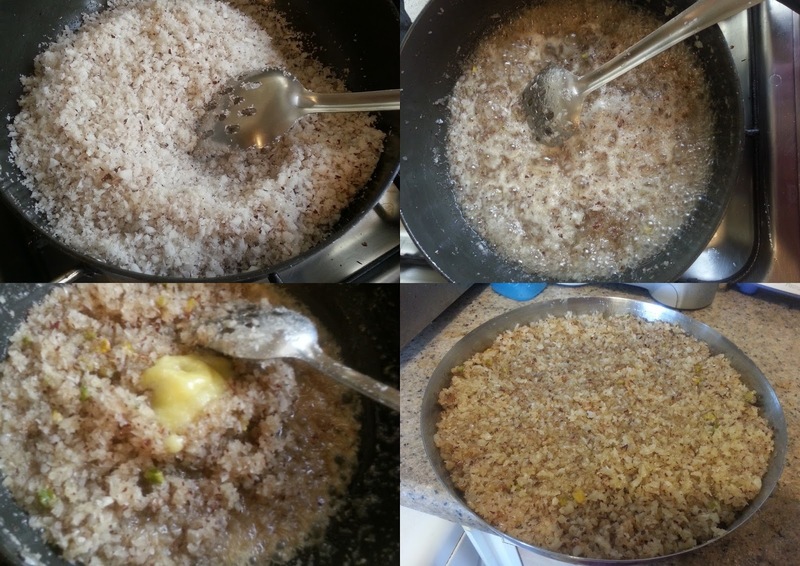 Switch off the gas and add teh sesame and flax seeds to the hot pan and cover it with a plate, as it will splutter out. Let the ingredients cool for 10 minutes. Then take them all together in a mixer and grind it to a powder. While grinding take care to grind it in a shot pulses. Since peanuts and sesame might release oil if grinded continoously. They might look little clumped after grinding, but they will be fine while mixing with rice. To make mixed rice, Heat 2 tsp oil, splutter mustard seeds, add round chilies, urad dal and hing. Pour this sizzling tadka over rice. Mix well. Now add 4 tbsp of the ground podi and mix well with a fork. Adjust salt and serve along raita or chips. If you prefer a slight tang in your podi/powder add a small lime-sized tamarind to it. Sending this to Kids Delight - Nuts & Legumes for Lunchbox happening @ +Srivalli Jetti space. 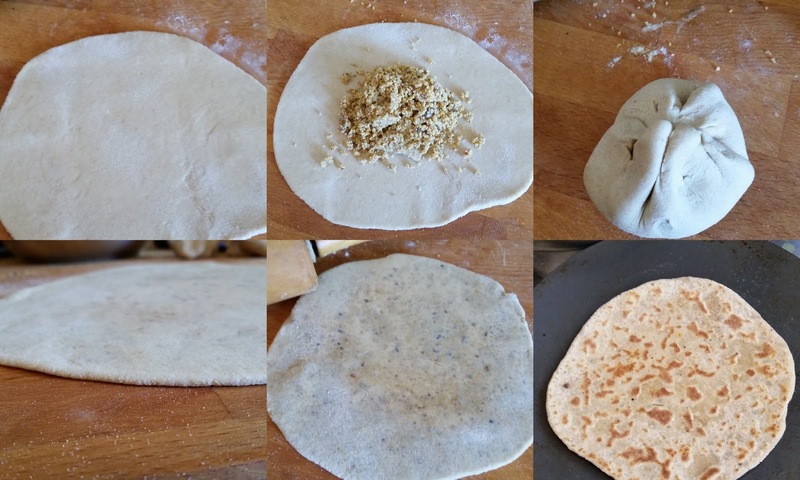 In my attempt to revisit my old recipes, i m today presenting you a delicious paratha. These peanut masala paratha, makes a yum anytime snack. When i made them today for our lunch, kuttu tasted them and asked whether i can pack this for his breakfast tomorrow. Bala just loved them with some plain yogurt on the side. The Masala can be made ahead and stored in the fridge for a week. They can also be used to make a quick mixed rice. Dry roast each of the ingredients separately, except tamarind. While roasting, roast flaxseed finally. Switch off the flame, and add the flaxseed to the hot pan. The residual heat will pop the flaxseed, try to keep it covered with a flat plate. Let it cool completely. Take it in a mixer, and grind it to a coarse mix. Not too coarse, but neither too fine. Keep aside, until use. Take flour in a wide bowl, i normally do not add salt to chapathi/paratha dough. If you add, add to the flour and whisk well to mix. Slowly add milk and water and make a soft dough. While finishing add oil and knead into the dough. Let the dough rest 30 minutes before proceeding to roll them out to make paratha's or plain roti's. Divide the dough into 12 portions. Roll each dough into a thick circle of 4-5 inches in diameter. Place 2-3 tbsp of filling in the middle of the rolled dough. Bring the edges together and seal the dough inthe center. Now dust the dough ball with flour and start rolling into a disc again. I rolled into a disc of about 6-7 inches in diameter. Heat a non-stick pan, cook the rolled out paratha on both the sides till golden brown. Serve it hot with sides of your choice. I served it with plain yogurt mixed with black salt and some plain dal. Another week of Blogging marathon, starting from today, i will be revisiting some of my old recipes, that needs some love & care. This tomato-garlic rasam is one of the few recipes i blogged during my blog budding days and is also one of the many recipes that needs some make-over. This Rasam is one which i make almost every week. After packing lunch for hubby, it is me and the kids and we don't feel like having sambhar everyday. So, it is either rasam or dal that makes into my kitchen almost during the weekdays. This Tomato-Garlic Rasam is an excellent choice to have during a cold/flu. It brings great relief.I don't say it substitutes your regular medicines, but definitely brings a great relief in those cranky/nagging/achy time. Chop the tomatoes, take it along with rest of the ingredients given under To grind in a mixer and grind it to a fine paste using 1/2 cup of water. Transfer the contents to another vessel and wash the mixie jar with another 1/2 cup of water and add that to the already ground tomato mixture. Now add rasam powder, hing and salt to the ground mixture and let this cook in a medium flame for 10-15 minutes. It will start foaming well, let the rawness of the rasam powder escape. 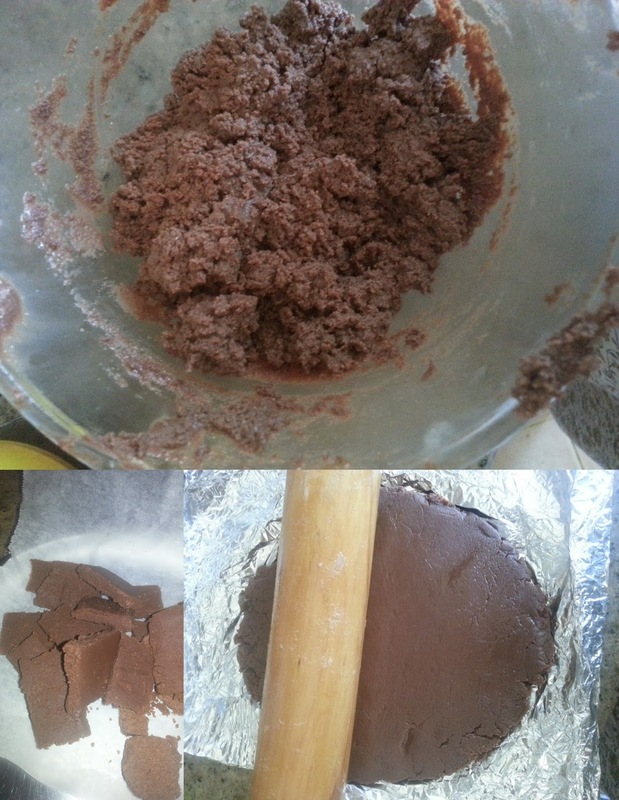 After 15 minutes, Check the consistency, if it is too thick, add another 1/2 cup of water or else leave it as such. If adding water, let it simmer for another 5 minutes. Take it off the stove. Now for the tempering, in a kadai, heat oil/ghee, splutter mustard seeds, add cumin, red chili and pepper powder. Pour this sizzling tempering on top of the rasam. Garnish with fresh coriander leaves and serve hot along with rice or just have it as a soup. Another tempting snack for this Diwali. 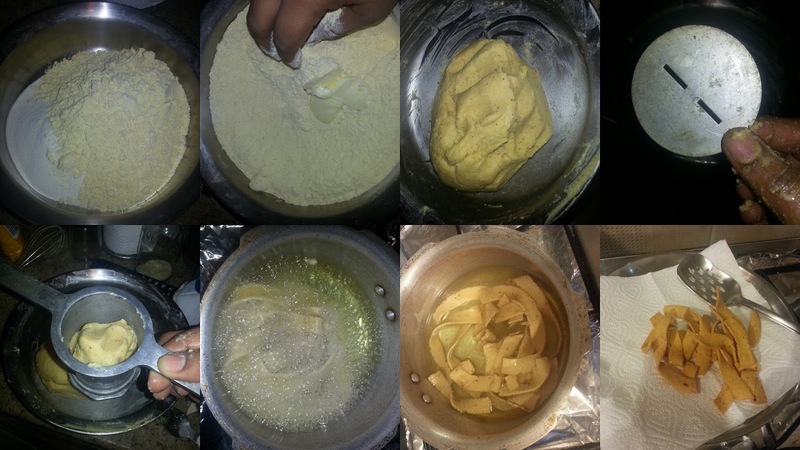 Ompodi/Omapodi, a gram flour snack made with ajwain/omam. It is a must-have snack back home for Diwali, as it is my Dad's Favorite snack. Appa likes Mysurpa and this Omapodi. So, his loving wife, my Mom makes both for Diwali. This is the first time, i making omapodi the traditional way. First when amma told that i have to soak atleast 1/4 Cup of ajwain for 2 cups of besan, i was thinking, what old lady, crazy? i don't want to make some medicine for indigestion, i making a diwali snack!!! But she told me to follow the recipe to the T, which i did. The result was a crunchy, munchy Omapodi which just vanished as i was making. Had a hard time controlling bala not to touch it anymore. I called her to tell that is a super-hit, she gave her traditional laugh at the other end. Soak Ajwain in 1/2 cup water for an hour. Grind the soaked ajwain with 1 cup of water and strain. I used half cup of water first, grinded, strained and again added another 1/2 cup of water to the ajwain pulp and grind again, strain. Throw away the remaining pulp. Take both the flours, salt, hing in a wide bowl and whisk well to get a uniform mix. Rub butter into the flour. Now add the ajwain/omam water to the flour and make a soft dough. You will be needing a Murukku press with idiyappam/Omapodi Mould. Divide the dough into 4 to 5 portion. Heat oil in a heavy-bottom pan/kadai.To check, whether the oil is ready to fry, add a drop of dough to the hot oil, if it sizzles up immediately, then it is ready to fry. Take a portion of dough into the press, press it directly onto the hot oil. Make concentric circles in the oil. Try not to overlap. Let it cook on both sides until sizzle seizes. It takes very less time to cook. While it is cooking, keep the press ready with next set of dough. The dough might turn a bit dry and difficult press in the process of making this. So, always keep 1/2 cup warm water by your side. Everytime you fill the press, sprinkle 2-3 tbsp of water to the dough portion and knead it a bit, make it soft and put it in the press, this way it will be easy to press it in the hot oil. Usually after Navrathri, we use up the coconut kept in the kalasam by making any sweet out of it. I had 4 coconuts lying around in the kitchen, i still have 3 out of them. So, with the kalasam coconut, it was 5. So, i made this Kesar Pista Coconut Burfi using 2 of them. It is a pretty easy sweet to make, you got to put everything together and stir a bit. Only care to be taken is not to scrape the coconut clean along with the brown peel of it. 2-3 tbsp ghee + 1 tsp for greasing the plate. Grease a flat plate with ghee and keep aside until need. Take everything except Ghee in a heavy-bottom kadai, Mix everything well and cook it in a medium flame. Keep stirring frequently, when the liquid has almost evaporated, add ghee and mix well and keep stirring. When the mixture starts leaving the sides of the pan and moves along your ladle. It is time to transfer it into the greased plate. Transfer the mixture on to the greased plate, smoothen the top using a greased bowl or parchment paper. When it is warm make markings using a knife,on top of the burfi. Let it cool well completely. Break the burfi along the marked lines and store it in an air-tight container. I stored in the refrigerator, since it was there for more than a 3 days. Diwali Preparations must be in full swing in all places, where they celebrating. I heard from mom and dad, that it is raining cats & dogs in chennai, and it is going to be a wet diwali there!! hmm, whatever it is the festive mood will be on a high whether it is wet or a dry Diwali!!! I repeat this every Diwali, we miss that noise and the spirit here in Dubai. Being away from your homeland during festivities is such a bummer, but what to do that is Life!!! Ok, now coming back to the recipe. A very simple recipe to try, is this Ribbon or Ola Murukku. The dough when pressed into hot oil falls like a ribbon, so the name Ribbon Murukku. It is actually made as a whole Murukku, then broken into pieces while storing. These make a crunchy snack for your evening tea/coffee or in your kids lunch box as a break-time snack. Take both the flours in a wide bowl. Whisk well to combine. Add red chili powder, hing, sesame seeds and salt mix well to form a uniform mixture. Now rub the butter into the flour mix. Slowly add water to this and form a soft dough. 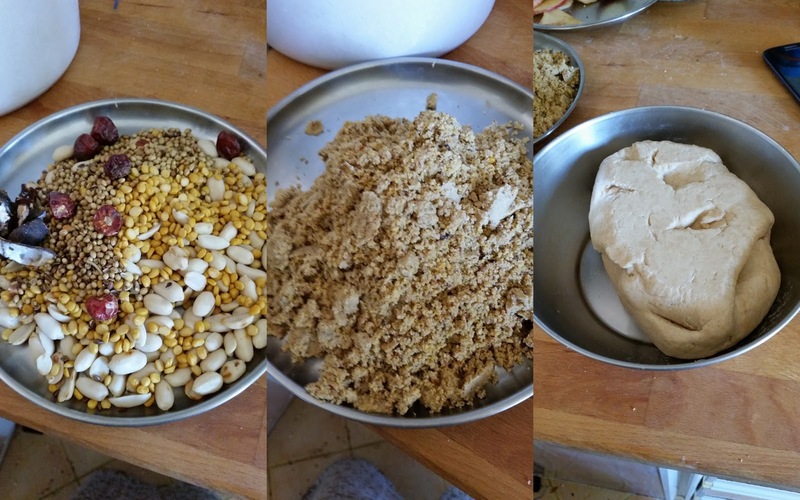 Since it is besan, there is a chance, the dough might turn dry while resting.So, for such cases, keep 1/2 cup warm water by the side and while using the dough just sprinkle 2-3 tbsp water and knead the dough and use. You will be needing a murukku press with ribbon mould to make this. Heat oil for deep frying in a wide kadai/pan. When a piece of dough dropped into the hot oil sizzles up immediately, then it is ready to deep fry. Take a orange-sized ball of dough and put it in the murukku press. Press it directly into the hot oil in a circular motion. Just make 2-3 circles of dough continously to ease even cooking. Flip and cook both sides until golden brown in color. While cooking, try to break the circle in 2/3 places to get individual ribbons. When the sizzle seizes, it indicates that the ribbon is cooked. Remove using a slotted spoon onto a kitchen towel. Let it cool completely, then store it in an air-tight container at room temperature. Stays fresh and good for 2 weeks. Starting with another week of Blogging Marathon, this week is going to be a Diwali Sweets & Snacks week, as i will be posting Diwali recipes. This Doodh Peda/Milk peda, is one of the easiest sweets that can be made when your pressed for time. The same recipe can be altered to Chocolate peda/Burfi recipe, and can also be done using Microwave just follow the same steps in Chocolate Burfi, without Cocoa powder. 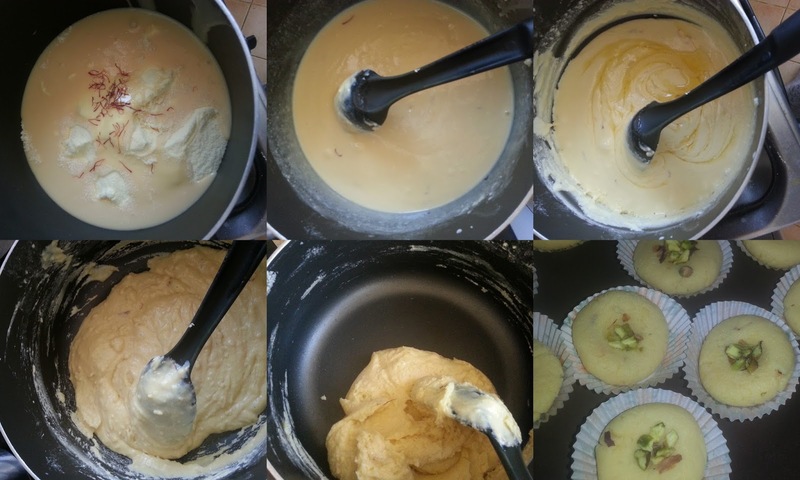 In a non-stick pan, take milk powder, condensed milk and mix together. It will resemble a gooey dough. Now add milk, saffron to this and Mix well. Keep the mixture on a Simmer flame on the stove and keep stirring. The mixture will start thickening and will come together as a mass. It will start following your ladle and you will be able to see the bottom of the pan. Now add ghee to this and give a quick stir and after a minute or two. Take it off the stove. Let this mixture cool for 10 minutes. When it is warm enough to touch, coat your palms with ghee and pinch lemon size balls off the dough and make a ball by rolling it in-between your palms. Slight press them in your palms to make a flat peda. Garnish with chopped pistachios. Since it is a milk product, it is advised to store it in the refrigerator. Take it out 10 minutes before serving. Petit Pains au Lait literally translates to small milk bread. This is a classic french recipe where the dough is made using only milk and uber delicious butter to enrich them. The bread is mildly sweet and so the toppings of pearl sugar adds a little more texture and also that missing sweetness of the milk bread to it. But i wasn't lucky enough to get pearl sugar when i baked them, so i went on with normal sugar crystals. The bread was amazingly soft and kids enjoyed them warm, with their evening milk and we enjoyed with a warm bowl of soup for our dinner. Though i remember taking step by step pictures for this bread, i dont remember where i have saved them, since i have formatted my phone's memory, i m not able to find it there too. Will check and upload them latter. The pain au lait can also be stuffed with chocolate or custard . The shape of the bread is what makes even more attractive than the pearl sugar, the crust is sniped with scissors to make a criss-cross pattern on them. Here is the video link showing how to make those razor sharp cuts on the crust. This bread is from We Knead to Bake #17 series. Though i baked them in June, i couldn't post them on time due to various constraints. But, here they are for the Kids Delight- Potluck party, happening @ +Srivalli Jetti's space. Take together both the flours, salt, sugar, instant yeast in the food processor bowl. Pulse it twice to mix well. Now slowly add milk and butter to get a smooth and elastic dough. Transfer the dough on to flat kneading surface and knead a couple of minutes to a have soft, smooth and non-sticky dough. If you feel the dough is dry, add little more milk a tsp at a time to get the dough consistency right.Shape the dough into a ball and place it in a well-oiled bowl and let it rest for 90 minutes or until doubled in size. Turn the dough out onto your working surface. You shouldn’t need any flour, but if you feel the need, just lightly dust your palms with it. Deflate the dough gently, and divide it into 10 equal pieces. Let them rest for 15 minutes. Roll out each piece of dough, one at a time, into a circle about 4” in diameter. Slowly roll up the circle from one end to another like a swiss roll into a cylinder. Pinch the seam closed neatly, and place them on a greased or parchment lined baking sheet with the seam side facing down. Cover loosely and let them rise for an hour or so till almost double in size. Brush them lightly with milk and using a pair of sharp scissors, make diagonal cuts (not too deep) on the top of the rolls. Sprinkle pearl sugar/ granulated sugar. Bake them at 200C (400F) for about 15 minutes or so until they’re golden brown. Let them cool on a rack. Serve them warm or at room temperature with coffee. with a warm bowl of soup for dinner/lunch or at breakfast. They’re best eaten the same day, though you could warm them up and serve the next day. I halved the above recipe and made 5 Petit pain au lait. A Collection of Naturally Sweetened Sweets @ Enveetu Kitchen. Diwali is a time where everyone should enjoy the delicacies made @ home. These days, there is somebody in the family who is forced by diabetes to avoid sugar and some due to their health conscience. But sweets can be made healthy too. It is White Sugar which we got to shun, these sweets are made using natural sweetening agents like jaggery, dates and honey. But, that doesn't mean you got gobble the whole lot on the D-day. Enjoy in moderate. They also make a great gift to your calorie conscious friends & their families. Try and let me know how it turned out!! Have a Happy and Healthy Diwali.Spread the Cheer and happiness around you!!! 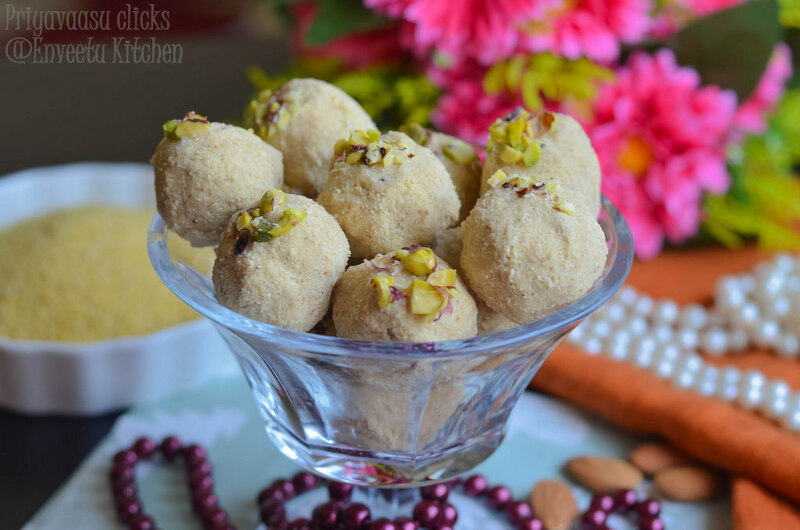 Thinai Laddu/Foxtail millet Laddu, uses jagery and NO Fat to make a healthy dessert that can be enjoyed by everyone. 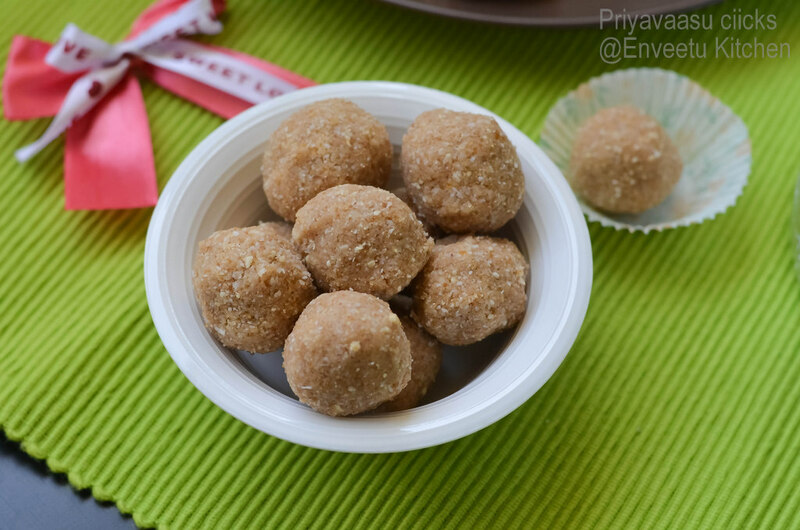 Andi Unda/Cashewnut and Rice balls, a delicious balls from Kerala Cuisine, made using red matta rice, jaggery and cashewnuts and the only fat is the fat from the nuts. Try it and you won't regret. 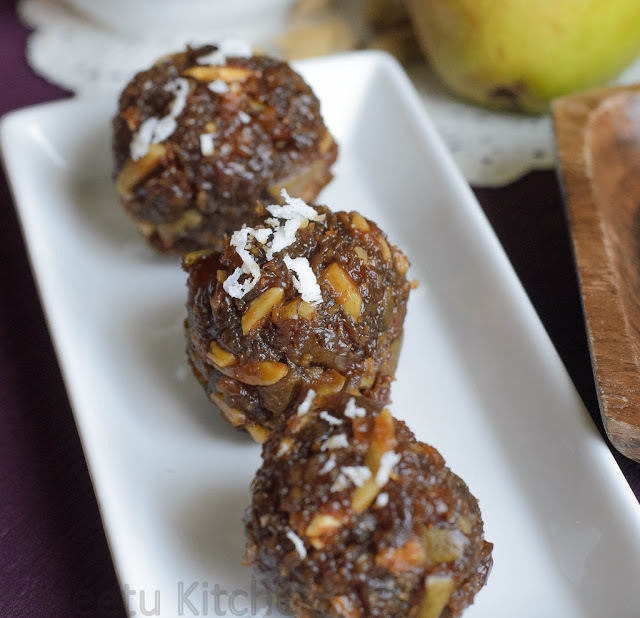 Narkol Naru/Sticky Coconut Balls, A Bengali Delicacy, sweetened using date syrup. 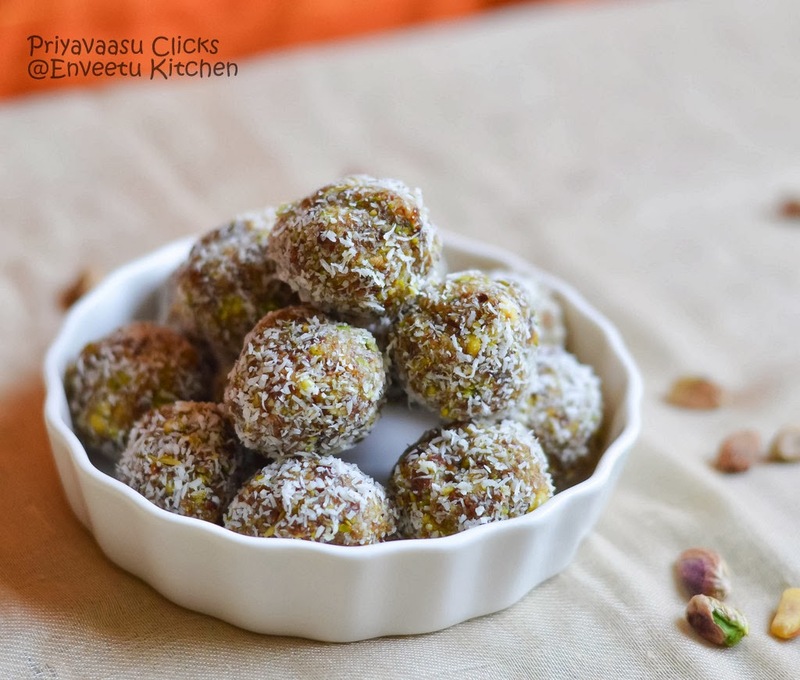 Pistachio Truffles, you are gonna love these, a mix of pistachios, coconut and dates that's all. Gozinaki/Georgian Nut Candy, Sweetened using honey, you are gonna to love this candy, it was a super duper hit amongst my friends too. Our last month's International cooking has made my bookmark list more longer. yes, there is lot more recipes to try and problem is if we don't try it immediately it goes back into that long list that is awaiting its day!!! One such dessert that falls in "try it immediately category" is Brigaderio, Brazilian chocolaty bonbon, a popular chocolate candy that is served as dessert and a specialty during birthday parties. These are super cute, chewy chocolate delights. There was one more variety, where it is made just with condensed milk and butter, then rolled with cocoa powder. I didn't know how my kiddos will take to raw cocoa, so i decided to make this chocolaty version. To make it little attractive, i just rolled it on pistachios.It was a super hit and Kuttu loved it to the core. In a non-stick pan, add butter when it starts to melt, add condensed milk and cocoa powder to it and mix well to combine. Keeping the flame at simmer, continue stirring the mixture, until it forms together as a mass and follows your ladle wherever it goes, (i.e) comes together. 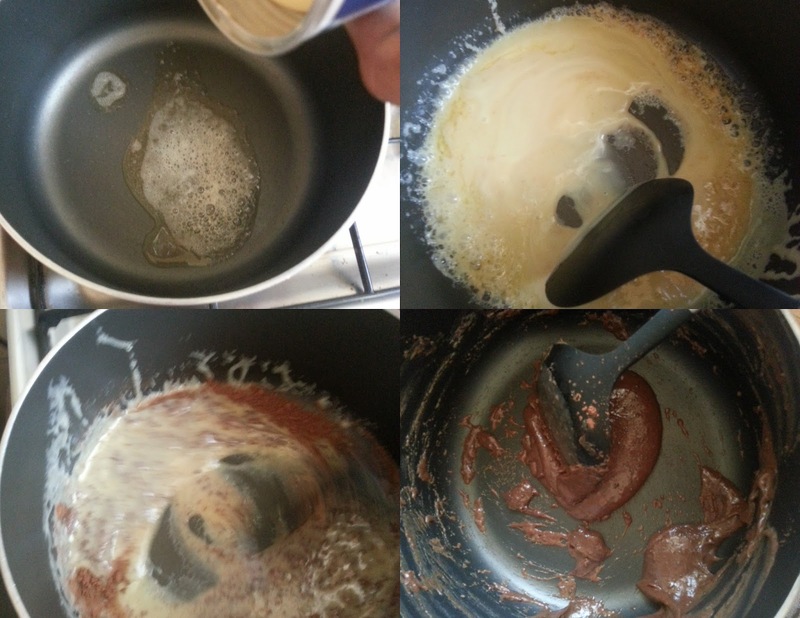 Alternately Suma says, you can check the done-ness by taking a spoon of the cocoa mass and turn it upside down, it should stick to the spoon for seconds and then glide down slowly back into the pan. Once done, transfer the mixture to a flat plate and let it rest for about 10-15 minutes or until it is warm enough to touch. While it is resting, chop the pistachios and keep the cocoa powder for rolling ready. 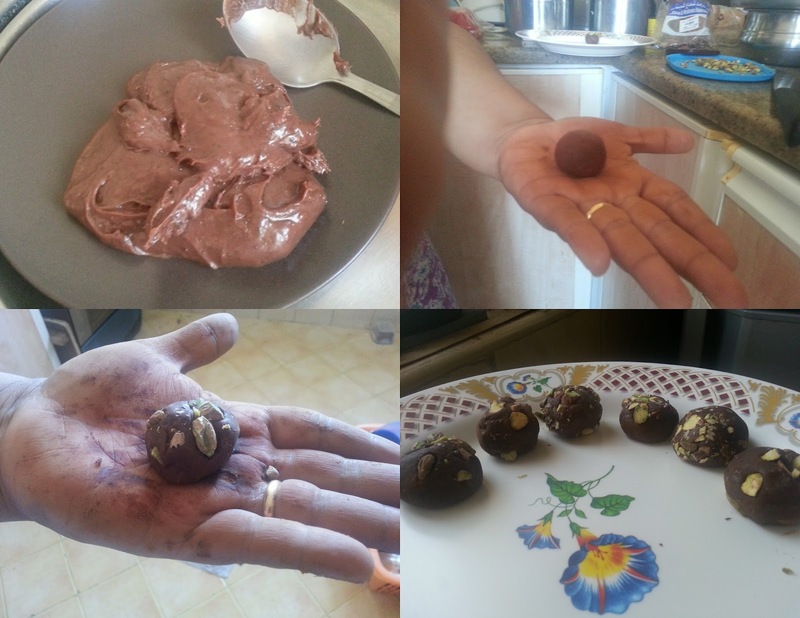 While shaping the balls, dust your hands with cocoa powder, pinch a small portion of the cocoa mixture and roll it inbetwen your palms to make a ball. Roll the made brigaderios on chopped pistachios to coat them. Let it rest in the fridge for about 20 minutes to firm up. Enjoy these chewy goodies and they make a wonderful gift during festive season too!!! Sending these cuties to Kids Delight - Potluck party, happening @ +Srivalli Jetti's space. You can make the truffles a little more bigger and make 6-7 out of these ingredients. I wanted to have a portion control so made bite-sized pieces. Try different toppings like fresh coconut, chocolate sprinkles, confetti, whatever your kiddo finds attractive. Beginning the second week of marathon with a delicious and super quick to make burfi/Barfi. This Barfi marks the beginning of Diwali treats here @ Enveetu Kitchen too. Every year, i start making trial sweets a bit ahead, so i would know what everybody @ home prefers and what to gift friends. So, one such trial was this Chocolate Burfi. Needless to say, it was a hit with Kids. Kuttu totally loved it, first it was chocolate and secondly it was soft and melt in mouth and with no nuts tidbits in the mouth. So, it would definitely be a hit at yours, if you have kids like mine or even adults like them. Take Milk Powder and Cocoa together in a Microwave Safe bowl. Whisk well to combine. 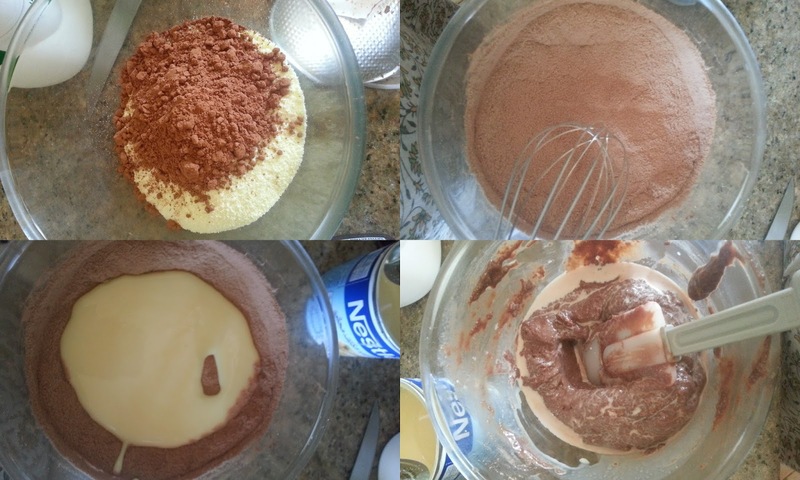 The Cocoa and Milk powder should mix well. Now add 1/2 tin Condensed milk to it and mix well. The Mixture will be very thick and will look like a dough. Now add 2 - 3 tbsp of milk to this and mix to get a gooey consistency. Add vanilla extract to this and mix well. Microwave the mixture on high for 1 minute, take it out, mix well and take it back to the Microwave and cook @ high for another 1 minute. The mixture will look all crumbly, but soft at this point. Add ghee to this and cook for another 30 seconds @ high. Take it out and let it cool for 10 minutes. At this point, you can grease your palm and make balls of it and make pedas. But i lined a flat plate with aluminium foil and transferred the mixture to it and spread it well and smoothed the top using a chapathi roller/belan or you can even use a parchment paper for this. Let this rest for another 15 minutes. Cut them into squares and store in an air tight container. I prefer to store in the fridge. It will stay good in the fridge for 2 days. Since it is made of milk, i recommend not to keep it more than 2-3 days. Sending this to Kids Delight - Potluck Party, happening @ +Srivalli Jetti's Space. Microwave power varies from brand to brand. So take care while cooking. But do not cook more than the given 2 minutes 30 seconds. If you feel the mixture is a bit dry and doesn't hold shape, add 2-3 tsp of milk mix well and proceed. This can be cooked on stove top also. Just mix everything and keep it on stove-top and keep stirring. When it all comes together without sticking to the bottom of the vessel, then it is time to transfer it to a flat plate and smooth-en the top. For the final day of the marathon, i bring you Maharastrian side-dish. Please don't be scared by the name. 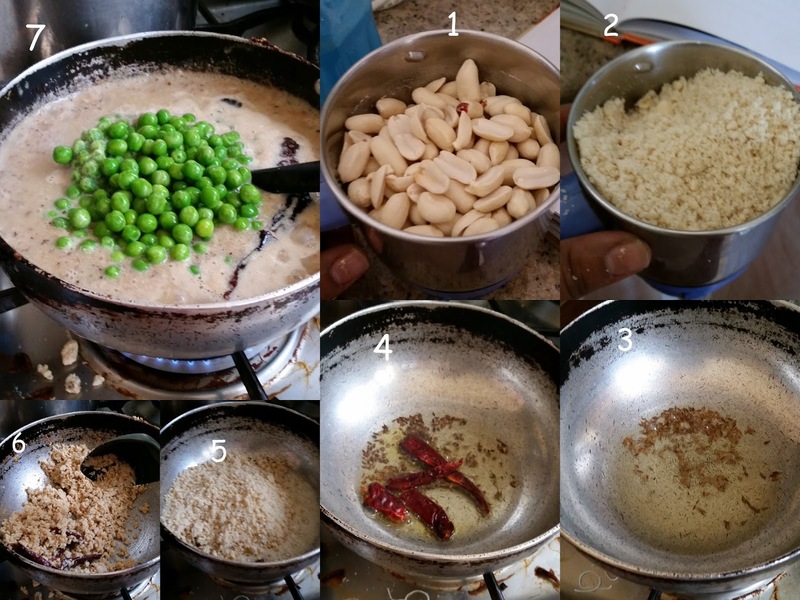 It is a simple and flavorful curry of green peas in peanuts and coconut masala. It was a wonderful combination with Roti's and even goes well with Rice. Keep the paste ready before proceeding to make the curry. Heat oil in a pan, crackle cumin seeds. Next add red chilies and crushed peanuts. Keep the flame low and saute for about 2-3 minutes. Take care not to burn the peanuts, you might get a bad taste. Next add the coconut paste, 1.5 cups of water, sugar and salt and cook on low flame till the peanuts are cooked. Next add the green peas and cook for 5-6 minutes for the flavors to mingle.Serve hot, garnished with the coriander. It's been a month since i cooked a relaxed meal like this. Somehow after vacation, it was always a hurry in the kitchen, festival, function and to top that the Mega BM cooking. So, i was busy making breads and no sides, it was either sour cream, cream cheese, icing sugar, or hummus to along with it. After all that hurry, burry, i cooked a curry today. 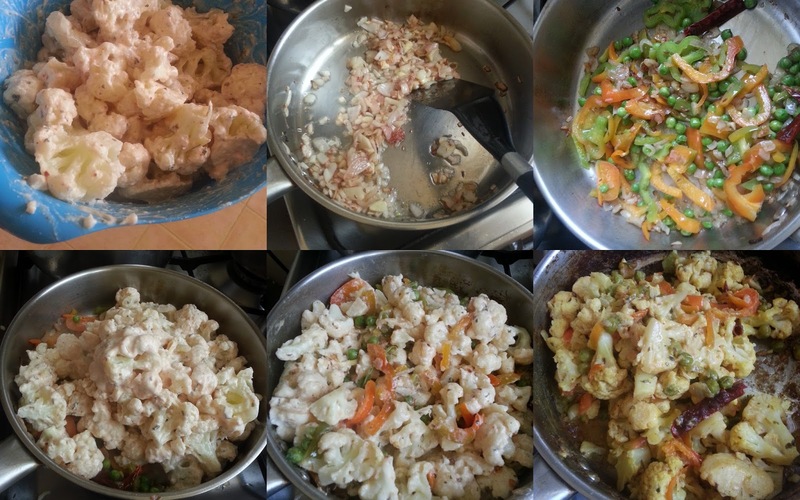 This Tandori Gobi was such a hit at home today. They didn't even leave the pan in which it was cooked, hubby and elder one, literally polished the pan clean, there is no need to wash that pan. Clean and cut the cauliflower into florets. I soaked them in warm salted water for 10 minutes. Drain and keep aside. Prepare the marinate by adding all the ingredients in a bowl large enough hold the cauliflowers too. Mix well, add the florets to it, toss well and keep aside for 30 minutes. Heat a pan with oil, add cumin seeds, let it crackle, add chopped onions, red chili and garlic. Saute until onions turn translucent. Next add chopped capsicum and green peas. Cover and cook for about 5-8 minutes. Now add the marinated cauliflower florets along with the marinate. Mix well. Let this cook for about 10-12 minutes until the cauliflower is cooked and the liquid is almost dry. Take it off the flame and serve it hot with roti's.